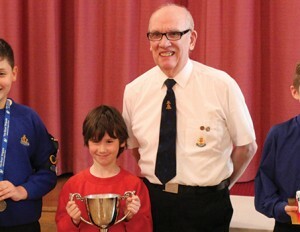 46th Aberdeen received the ‘Simon Smith Trophy’ at a special presentation at the end of April. The trophy, named in memory of former BB Development worker, was presented to the 46th for winning the ‘Fifteen for 2015’ challenge. As part of the 15 tasks, the young people tried a new sport, produced an advert to publicise The BB and even make contact with a BB group overseas. The judges were impressed with the effort and imagination shown by the young people of the 46th.